Leopold Mozart saw it as his duty to display publicly the miracle of his son’s musical precocity; it could also help the family finances. When Wolfgang was six he was taken to Vienna, where he and Nannerl played at the imperial court and at lesser courts on the way. He played at sight, improvised in various styles, played with a cloth covering the keys and accompanied other musicians. In 1763 the family embarked on an extended European tour, with the archbishop’s permission and probably with financial backing from Salzburg friends and business people. They went to the main courts of southern and western Germany, including those at Munich, Stuttgart and Mannheim, then up the Rhine to Brussels and on to Paris. There they charmed Louis XVI and Marie Antoinette, and Mozart’s earliest publications, sonatas for harp­sichord and violin, were issued. They went on to London, where they spent 15 months, and played to the royal family and in public; there Mozart wrote his first symphonies and met J. C. Bach, who became a friend and was a lifelong influence. They returned via Amsterdam and, again, Paris, then home through Switzerland and southern Germany. They arrived back in Salzburg at the end of 1766, laden with gifts – gold rings, watches and snuffboxes – but less actual money than Leopold (and presumably his backers) had hoped. Mozart met many musicians during these travels and was quick to learn from everything he heard; his cosmopolitan upbringing had far-reaching effects on his development as a man and musician. The Paris sonatas were soon followed by another group printed in London and a third in The Hague. Also from these years are some lively symphonies, written in London and the Low Countries, in a style much affected by his father’s but showing his awareness of J. C. Bach and others whose music he had heard. Back in Salzburg, he wrote music for a school opera and part of an oratorio. The family went to Vienna in 1767–68 for 15 months, where he wrote an Italian comic opera in the manner of those he had heard there (it remained unperformed) and a little German comedy, Bastien und Bastienne; he also composed a Mass for the dedication, before the Emperor, of a new orphanage church. To most Germans and Austrians, Italy was the land where much of the best new music came from, particularly opera. 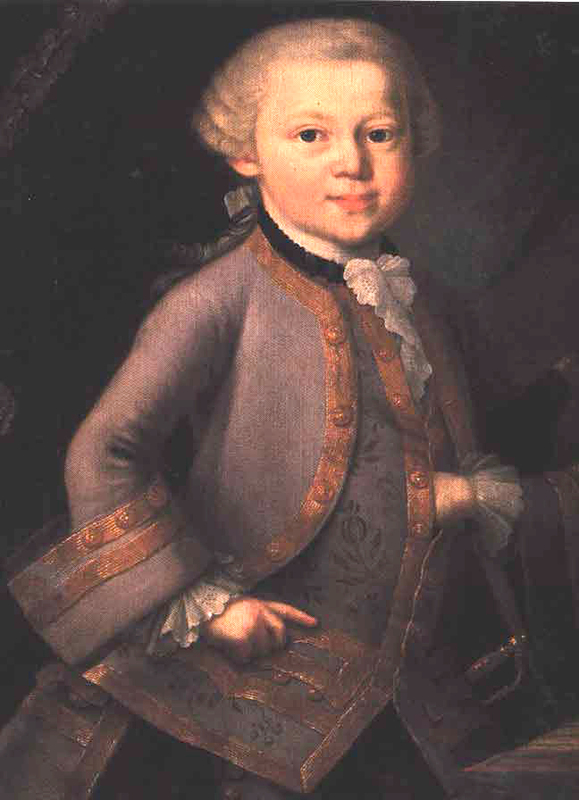 Leopold was eager to take his son there, partly to complete his musical education, partly to capitalize on his gifts while he was still young enough to be a source of wonderment. They left in December 1769 for Milan, the centre of Austrian government, pausing on the way to play to potential patrons. It was arranged in Milan that Mozart would compose the opera to open the next winter season; then they moved on – to Bologna, where Mozart visited the theorist and teacher Padre Martini, and to Rome, where he wrote out from memory, after a single hearing, the Sistine choir’s exclusive showpiece, Gregorio Allegri’s (1582–1652) Miserere. They went to Naples, seeing Pompeii and Vesuvius, then back to Rome, where Mozart received a papal knighthood; Bologna again, where he was admitted to the esteemed Accademia Filarmonica; and back to Milan, where he composed the opera Mitridate, given on 26 December 1770: Mozart himself directed the first performances. Father and son returned home in March after a trip to Venice. They had picked up further Italian commissions and went back to Milan in October 1771 for the performance of a serenata, Ascanio in Alba, in honour of a royal marriage. More large-scale works followed: an oratorio commissioned for Padua, a serenata to celebrate Archbishop Schrattenbach’s anniversary which, when he died, was adapted and used instead to celebrate the enthronement of his successor, and then another opera for Milan, Lucio Silla, for which Mozart and his father returned at the end of 1772. Leopold also made enquiries about a post for his son in Italy, but evidently drew a blank. One of Archbishop Colloredo’s first actions had been to appoint Mozart, then 16, as a salaried Konzertmeister; until then he had been unpaid for his services – playing the violin in the orchestra and composing for court and cathedral. However, the Mozarts were discontented: Salzburg employment limited their opportunities. They had a spell in Vienna in 1773, investigating the situation there, but evidently returned disappointed. Mozart’s contact with new Viennese music was fruitful, however, as his compositions of the period show: among them are six string quartets, his first piano concerto and some violin concertos, several serenades for Salzburg university ceremonials and a series of symphonies – a fiery one in G minor and a spirited, lyrical one in A are the earliest to have firm places in today’s repertory. These years also saw the composition of a quantity of church music, notably a group of Mass settings. Larger works from this time are a serenata, Il re pastore (‘The Shepherd King’), written for an archduke’s visit to Salzburg, and a comic opera, La finta giardiniera (‘The Pretend Gardener Girl’), for performance in Munich. In 1777 they lost patience: Mozart, with his mother to watch over him, went off to seek his fortune elsewhere. Offered nothing in Munich, he moved on to Mannheim. This was one of the liveliest courts in Germany. Presided over by the Elector Carl Theodor, it had a fine orchestra, created by Stamitz, which developed a new style of orchestral playing. Mozart was eager to be part of this distinguished group and quickly made friends there. He even composed a piano sonata picturing the character of the Kapellmeister Cannabich’s daughter – ‘anyone can see it was composed in Mannheim’, wrote Leopold when he saw it, so distinctive is the Mannheim flavour. The style left its mark: several of Mozart’s works of the next years show its influence. Despite the good impression Mozart made in Mannheim, his requests for a position were turned down. Perhaps employers were not keen to have restless geniuses at their courts. It was here, however, that he fell in love with a fine singer, the soprano Aloysia Weber. His father, infuriated by his dawdling, directed him on to Paris, one of the largest musical centres in Europe. Mozart had good connections and soon had music performed at the Concert Spirituel, which gave concerts during Holy Week and on other religious holidays. Its orchestra was famous for its showy performances and Mozart exploited its virtuosity in his Paris Symphony (No. 31). But he did not like the French, and apparently made that clear: with half the talent and double the shrewdness, a friend told Leopold, he would have flourished in Paris. While here, he also finished the groups of sonatas begun at Mannheim. But tragedy struck: his mother was taken ill and died. He broke the news gently to his father in a letter saying that she was ill, writing of her death to the family priest and asking him to tell his father. It was also becoming clear that there was no job to be had in Paris. Eventually his father arranged for him to return home to take up an improved post as Konzertmeister-organist. Mozart did so, reluctantly and slowly – and an encounter with Aloysia on the way, at which she rejected him, deepened his misery. Much of our information about Mozart’s life comes from the family correspondence. On the early tours, Leopold wrote numerous letters to his landlord, a good friend and probably one of those who underwrote the journey; much of the information was commercial, for circulation among a group in Salzburg. When father and son went to Italy, they reported home regularly to Mozart’s mother and sister. When Mozart and his mother travelled, they in turn reported to Leopold and Nannerl, and Leopold often sent detailed instructions, as well as reports on events back home, to the travellers. In later years, Mozart kept a correspondence going with his father. Here and there, especially during the Mannheim–Paris journey, irritation creeps in, where Leopold feels that his son is behaving unwisely; and occasionally Mozart himself tells half-truths. But the letters, especially Mozart’s own, are written in a lively fashion, with much information on Mozart’s own music and performances, on musicians and musical events more generally, day-to-day happenings, events in Salzburg and much else besides. Mozart again dawdled on his way home, pausing at Mannheim and Munich – to which, after the War of the Bavarian Succession, the Mannheim court had moved. There followed nearly two years (1779–80) in Salzburg, during which he wrote several sacred works (including the popular Coronation Mass), a richly scored and deeply felt Sinfonia Concertante for violin and viola, three symphonies and part of an opera (Zaïde, which he never completed). Then in summer 1780 he was invited to write a serious opera in Italian, Idomeneo, for production in Munich. He went there in the autumn to hear the singers and to compose it. Mozart’s correspondence with his father, acting as intermediary with G. B. Varesco, who prepared the text from its French original, tells us much about Mozart’s attitudes to musical drama and his composition process. Idomeneo is a work of great richness and expressive force, much enhanced by the orchestral writing for the former Mannheim players. Mozart was still in Munich when a message arrived: he was to go at once to Vienna, to attend Archbishop Colloredo during the celebrations of the accession of Joseph II as emperor. When Mozart arrived in Vienna he was embarking on a career in the principal musical metropolis of central Europe. Vienna, royal capital of the Austrian Empire and imperial capital of the Holy Roman Empire, was a musical melting-pot, full of Bohemians, Italians and Hungarians as well as Austrians and Germans. There were court appointments for musicians, mostly held traditionally by Italians. There was a court opera at the Burgtheater, run as a German opera house or Nationaltheater from 1778 to 1782 as part of Joseph II’s reforms, but then reverting to Italian opera – primarily comic, mainly because Joseph was unwilling to pay the much higher fees demanded by singers of serious opera. There was also some concert activity, mainly in the Easter season and at Advent, and occasionally in the summer, but public concerts were given only occasionally and generally on a speculative basis by individual performers. In May 1781, Mozart reached crisis point in his relationship with Archbishop Colloredo, who required him to refuse an invitation to play before the emperor. He angrily resigned, and was literally kicked out by the archbishop’s steward. Leopold was dismayed and fearful for his own job in Salzburg. Mozart, however, relished the prospect of a freelance life in Vienna, where he would combine teaching (a well-paid activity, since lessons were normally given daily) with playing and composing. He took on several noble or bourgeois young ladies as pupils, and published some new sonatas, a traditional way of raising one’s profile as a composer. He made occasional appearances at court, notably in a piano contest with the visiting Italian virtuoso Muzio Clementi (1752–1832). And he obtained a commission to compose for the opera: it was to be a German piece, Die Entführung aus dem Serail (‘The Abduction from the Harem’). It was given in July 1782; Joseph II is alleged to have reacted: ‘Too many notes, my dear Mozart’, to which Mozart responded, ‘Just as many as are needed, Your Majesty’. When he left the archbishop’s employment, Mozart moved into lodgings. The Weber family (related to the composer), whose second daughter, Aloysia, he had fallen in love with in Mannheim, now lived in Vienna; they took him in. He became attached to the third daughter, Constanze, and her mother and her guardian (the father had died) began pressing him to marry her. He was 26, she was 20; she was a capable but not professional singer. Leopold was against it: he felt that Mozart’s career was not yet established. But Mozart was eager, and the couple were married on 4 August 1782: Leopold’s grudging assent arrived the next day. A project particularly dear to Mozart in these years was the composition of six string quartets (this was the standard number for a set to be published). He began in 1782 and did not complete the task until 1785: these works, in a genre regarded as his most intimate, serious and personal, are written with a keen awareness of Haydn’s master­pieces, but are also highly individual in the way the medium is handled, especially in the dialogue between instruments. Mozart dedicated the set not to a patron (who would have provided a handsome gift in return), but to Haydn. Mozart wrote four further string quartets, as well as piano trios and quartets; perhaps his crowning achievement in chamber music is the pair of string quintets, K515 and 516, of 1787, works of a new richness, warmth and depth of feeling. But Mozart’s chief ambition, expressed many times in his letters, lay in opera. In 1783 he had met Lorenzo da Ponte (1749–1838), who had become court poet in Vienna. Two years later Da Ponte supplied him with an operatic version of the Beaumarchais play Le mariage de Figaro, its subversive political content somewhat watered down: the opera, Le nozze di Figaro, was finally given on 1 May 1786. This brilliant comedy of social and sexual tensions greatly extends the range of opera buffa, with its powerful depictions of the grief of the neglected countess and the jealous fury of Figaro; but its chief achievement lies in the way Mozart used ensembles, especially the long act finales, to portray the action, using symphonic structures and changes in metre, key, tempo and orchestral colour to convey the situations and emotions of the characters. Figaro was a success, particularly in Prague, which he visited at the beginning of 1787; he returned home with a commission to write an opera for the Bohemian capital on the Don Juan story. Da Ponte prepared a libretto (based on an existing one) and the new opera was given on 29 October 1787 (and revived in Vienna the next year). Like Figaro, Don Giovanni is concerned with class and especially sexual tensions, and although Mozart still treats it as a topic for opera buffa, it has darker, demonic aspects – as he makes clear with his powerful, stormy D minor music for the appearance of the ‘stone guest’ (the statue of the murdered father of Donna Anna, whom Giovanni had sought to violate), who consigns the sinner to the flames. Writing operas for major opera houses brought Mozart into contact with some of the finest singers in Europe. He had met well-known singers during his travels, particularly in Vienna and London, and had taken some lessons from a leading Italian castrato. When composing an opera, it was normal to design the music specifically for the singers taking part in the first performances: composers wrote their music for the occasion, not for posterity – most operas had only one run of performances, and if given again they would be revised. So he did not compose Mitridate or Lucio Silla until he reached Milan and could hear the actual voices; he prepared the recitatives in advance but not the arias. Then he would submit each one to the singer, and try it over, as it were, for size (he once wrote that an aria should fit the singer’s voice like a well-made suit of clothes). In the case of Mitridate, most of the singers asked for revisions, and one complained so much that Mozart made five attempts at an aria before he accepted it. Even later in his life, Mozart, like many other composers, worked in this way: when The Marriage of Figaro was revived, three years after its composition, he rewrote two arias for a new singer in quite a different style to suit her voice. The series of piano concertos Mozart wrote in the years 1784–86 represent one of the peaks of his creative achievement. He had composed a handful of piano concertos before (including one remarkable work just before he left for Mannheim in 1777). Now, however, mainly for the concert series he was giving in Vienna, he wrote several more: a dozen, over three years, each one a distinctive masterpiece. In them he forged a new kind of relationship between soloist and orchestra, related to that of the earlier concerto and especially the aria (with the piano, as it were, taking the place of the voice), in which the allocation and interchange of material is handled with great subtlety and imagination; the rich writing for the orchestral wind instruments helps give each concerto its particular character. Some are highly virtuoso works (K450, K451), others are more lyrical (such as K453, K456 and K488), while those of 1785 and 1786 – including the two in minor keys, D minor K466 and C minor K491, and the two C major works K467 and K503 – have an increasingly symphonic quality. Life as a freelance musician was not easy. Mozart hoped for a court position, and obtained one at the end of 1787, as Chamber Composer at 800 gulden per annum. This was a good salary and the duties were modest. However, Mozart had got into financial difficulties. Times were hard in Vienna, as Austria was at war: concert life was at a low ebb, the flow of pupils had dried up and interest in him seemed to have waned among the notoriously fickle Viennese public. He earned some money by publishing, and wrote a few works for the purpose. Operas brought in a fee, but not a large one. Mozart in fact earned much more than most musicians, but seems to have spent heavily, partly because of the obligations imposed by the circles in which he moved and partly because of Constanze’s health (she had had several pregnancies). He repeatedly had to borrow from a fellow Freemason (he had joined them in 1784), and was still in debt at his death. Mozart, Constanze and their one surviving son moved away from their central apartment by the cathedral at the end of 1787; they moved again in spring 1788 to the suburbs. There, in the early summer, he wrote three symphonies – probably he was contemplating a concert series, and interest in piano concertos had diminished. These three works, in E flat, G minor and C, called Nos. 39, 40 and 41 (the numbering bears little relation to reality: he had written more than 50), represent his final symphonic testimony. No. 39 is distinguished for its warm lyricism. No. 40 is usually regarded as a tragic work; its tone of passion is to most listeners unmistakable. No. 41, ‘Jupiter’, is a noble piece in the tradition of C major works, with the military rhythms and the trumpets and drums of its first movement; but its andante is lyrical and deeply felt, and the finale, using fugal processes within sonata form, has a richness and grandeur of its own. In 1789 Prince Karl Lichnowsky, who had been a patron of Mozart’s, asked the composer to accompany him on a journey north. They went to Prague, Dresden (where he played at court) and Leipzig – here he visited the Thomaskirche and played on the organ that had been J. S. Bach’s. In Berlin and Potsdam they visited the court of Friedrich Wilhelm II, and he went back to Leipzig to give a concert. He may have been commissioned to write some music for the king. But the journey as a whole was unprofitable and there is reason to think that his relationship with Lichnowsky deteriorated. The next year he went to Frankfurt for the coronation of Leopold II as Holy Roman Emperor: he was not in the court retinue, to his distress, but went anyway as he felt he might profit from the gathering of people. He gave a concert, with two piano concertos: it was ‘a success as regards honour and glory, but a failure as far as money was concerned’. The capital of Bohemia in Mozart’s time was to some extent a musical outpost of Vienna. Mozart’s visit at the beginning of 1787 – when he performed the symphony now known as the ‘Prague’, No. 38 – was the first of five: the second was for Don Giovanni. He had friends in the city and passed through twice in 1789; then in 1791 he was invited to write the opera to be given in celebration of the coronation as king of Bohemia of Leopold II, Joseph’s successor as emperor and to conduct his Coronation Mass. The opera, La clemenza di Tito (‘The Clemency of Titus’), was not particularly successful with the king or queen, but Mozart was admired in Prague and seems to have been happy there. At the beginning of 1790, the third of Mozart’s operas written with Da Ponte, Così fan tutte, had its premiere: his graceful and heartfelt music adds depth to this ostensibly lightweight tale about two officers who test their fiancées’ fidelity and find it wanting. (The title is difficult to translate: it means literally ‘Thus Do All Women’, and might be rendered ‘All Women are Like That’.) In spring 1791 the prospect of financial security came closer when it was agreed that Mozart would be appointed Kapellmeister at St Stephen’s Cathedral on the death of the elderly incumbent. Two operas followed in the summer. Working with Emanuel Schikaneder, singer, actor, manager and librettist, he wrote Die Zauberflöte (‘The Magic Flute’) for a popular theatre in a Viennese suburb: given on 30 September, it was an immediate success, with its mixture of comic pantomime and solemn, masonic-influenced ritual, paralleled in music that embraces catchy songs, entrancing arias and duets, spectacular display pieces and noble choruses. A few days later Mozart completed his Clarinet Concerto. On 6 September the coronation opera La clemenza di Tito had been given in Prague; commissioned late, it had been written in some haste (allegedly in 18 days). Another important commission had come during the summer, for a Requiem, to be composed secretly for a nobleman, recently widowed, who wanted to pass it off as his own tribute to his late wife. The fee was generous and Mozart accepted, but work had to await the completion of the other commissions. In fact the Requiem was never finished. Mozart is said to have had premonitions of his end while writing it, although his letters of the time show him in good spirits. In November he was taken ill, and on 5 December he died. The cause is uncertain; probably it was rheumatic fever or infective endocarditis. He was buried simply, according to the custom of the time, in an unmarked grave. On 10 December, parts of the Requiem (completed by his pupil Franz Xaver Süssmayr, 1766–1803) were sung at St Michael’s Church, Vienna, in his memory. Tradition has it that Mozart wrote entire movements in his head before putting a note on paper. Certainly he had extraordinary gifts for planning a piece and visualizing its broad shape. However, the sketches and manuscripts he left make it clear that the music did not spring fully developed from his brow. He tended, when composing, to write out first the main line – often the first violin part, or the vocal line in an aria – with some of the bass line, and indications of detail in the accompaniment or in passages where the main line was discontinuous. Then he would go back and fill in the harmonies, the accompaniments, the orchestration: remarks in his letters, too, suggest that he regarded composing as a two-fold process, the initial act of creation, the secondary act of completion (once he even talked of composing a second movement while orchestrating the first). It was not as easy, though, as writers have suggested and as the polished results might seem to imply. It was hard work, demanding long hours and intense concentration, and in some kinds of music – the six string quartets composed in 1782–85, for example – the original manuscript makes it clear how much effort he put into bringing the music to its final form. It was partly because he was impressionable, and partly because he was intensely competitive, that Mozart was so affected by the different musical styles he encountered in his childhood, youth and early manhood. In London he imitated J. C. Bach; in Italy he wrote in the light, crisp orchestral style cultivated by such men as Giovanni Paisiello (1740–1816) and Pasquale Anfossi (1727–97); after his visits to Vienna of 1768 and 1773, he was using the richer, more developed Viennese orchestral manner; after his months in Mannheim he was drawing on the orchestral effects (crescendos, tremolandos, ‘rockets’) cultivated by the composers there; and after his stay in Paris he was ready to write an opera that had echoes of Gluck and Niccolò Piccinni (1728–1800), whose supporters had been at loggerheads during his visit. Once, passing through Munich, he commented approvingly on the piano and violin sonatas of a minor composer, Joseph Schuster: those he wrote a few weeks later use the same processes – but incomparably better and more interestingly than the original composer’s. Mozart was not a borrower. What he did was to note the methods and the processes, then draw what he valued from them and adapt it to his own needs. He was competitive: he saw what others were doing and proved to himself and the world that he could do it better. In his mature years external influences diminished, although he was clearly affected by his contact with Haydn from the early and middle 1780s onwards. This synthesizing procedure lies at the heart of Mozart’s genius, his ability to absorb, to develop his own unique style by blending others together; all of this accounts for the universality of his music. (Updated extract from The Classical Music Encyclopedia, Edited by Stanley Sadie, Foreword by Vladimir Ashekenazy), Flame Tree Publishing, new edition 2014). Available in all good bookstores, on Amazon and our own website (with free shipping) here. This entry was posted on December 30, 2018 by Flame Tree Music in Biography, Mozart.